I joined the Team Salomon Chile for a training run on Cerro San Cristobal this weekend. I was fortunate enought to meet some of the team members for the K42 and they welcomed me into the Chilean trail running community. It's a great team with a coach, many experienced members including 4deserts and UTMB finishers, and a regular training program close to where I live. We did a 15km route around Cerro San Cristobal on some new trails for me and I really enjoyed running with a group. I had a great time and was really enjoying myself and fitting in the group well. 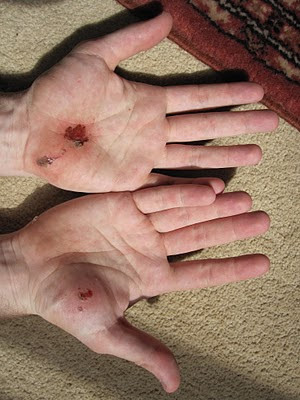 Just to make myself more noteworthy on my first run, I managed to take a great fall on a rocky, downhill section and scrape-up my hands. I arrived at the end of the run with bleeding palms and couldn't shake hands with anyone when I left! Results of falling in front of new friends on an easy run!